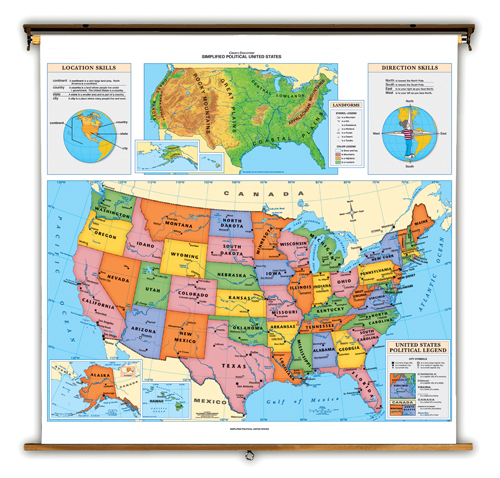 Second and Third Grade students need a transition map between primary map and the more advanced political and physical maps they will encounter in later grades. The Discovery United States Map accomplishes this task. Both a physical and political map are show to introduce the student to the different representations of the United States. A more detailed United States Map shows more rivers, lakes, and cities. The legend is taken directly from the map to provide an easy to understand key. Printed on non-tear material, and mounted on heavy duty spring roller in brackets with backboard. 51 inch x 51 inch . Markable.